The Curiosity rover continues its journey in the crater Gale on the surface of the planet Mars. Last week, NASA released the results of a study of two samples taken and analyzed by the rover. These results have been much talked about because they show the presence of organic compounds on the surface of the planet Mars. But the presence of organic chemistry does not automatically mean a presence of life. This term simply describes the chemistry of carbon. But since organic compounds are very widely used and synthesized by living processes, the two are generally associated. The Curiosity rover has already detected elements of organic chemistry on Mars. There is of course the methane of the Martian atmosphere that continues to intrigue us because we do not know its origin yet. The Curiosity rover had also identified trace amounts of organic compounds in samples taken from its drill. The quantities collected were, however, too small to rule out the hypothesis of contamination. 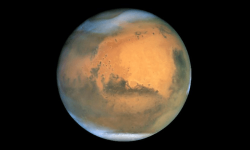 This time, the quantities detected are 100 times larger, which makes it possible to be certain that these molecules are indeed of Martian origin. These are derivatives of thiophene, molecules that are strangely similar to the material that allows the creation of oil on the planet Earth. On our planet, under certain conditions organisms can sediment and turn into hydrocarbons. This process leaves traces of thiophene derivatives. Discovering these same molecules on Mars inevitably raises questions. It is believed that the Gale crater hosted a lake about 3.5 billion years ago. This is also the age of the samples analyzed by the Curiosity rover. In other words, it is probably the most convincing indication of a past life on the surface of the red planet. This clue is far from enough. These molecules could have been produced or consumed by living beings, but they could also have been created by processes that have nothing in common with life. The Curiosity rover has served its purpose well and the potential for discovery is great for future missions. The ExoMars and March 2020 rovers, which will arrive on the red planet in 2021, could conclude the debate. Their abilities will be much higher than the capabilities of Curiosity. ExoMars will be able to drill up to two meters deep, while the Curiosity rover can drill only a few centimeters deep. The samples it analyzes will have been preserved from the radiation and surface oxidation of Mars. Let’s hope that the Oxia Planum site that has been selected by the European Space Agency to host the rover will be as interesting as the Gale crater. It is a basin of 200 kilometers in diameter that has probably sheltered a lake or a sea. Meanwhile, the Curiosity rover will be able to continue to pierce the Martian soil. Its drill broke down in December 2016. NASA has been thinking about an original solution to get around the breakdown, and after a few tests the tool has been operational again since the end of last month. The Curiosity rover is not equipped to directly identify life forms or their fossils. We can not hope that it will discover other organic compounds. The Curiosity rover has been on a mission on Mars since the summer of 2012. It is equipped with a drill which allowed it to take samples on about fifteen sites. Unfortunately this drill broke down at the end of 2016 because a defective motor prevents the drill from coming out and retracting into its holder. NASA engineers have been thinking about a solution. In its classic operation, the drill is placed near its objective by the Curiosity rover arm. It is then pushed through the area to be drilled by the engine that has failed. The idea is to keep the wick completely out of its support and use the arm of the rover to push. It’s like drilling a wall with one hand with your arm extended. It’s not ideal for accuracy and vibration, but it works. A first test made it possible to drill one centimeter deep in the area where the rover is currently located. More tests will be conducted in the coming days and weeks. However, it must be ensured that the collected samples can be brought to one of the two Curiosity rover analysis laboratories. For this, Jet Propulsion Laboratory (JPL) engineers have successfully tested a method on Earth. But nothing says that it will work in the Martian environment. If the results of these tests are satisfactory, then the drill will resume its mission and the Curiosty rover will provide us with answers on the possible presence of water in the past of Mars. On January 26, 2018, the Curiosity rover accumulated 2,000 days on the surface of Mars. To celebrate, NASA shared a beautiful panoramic photo of the crater where it landed and continues to conduct its investigation. The Curiosity rover is responsible for determining the ability of the red planet to welcome life. 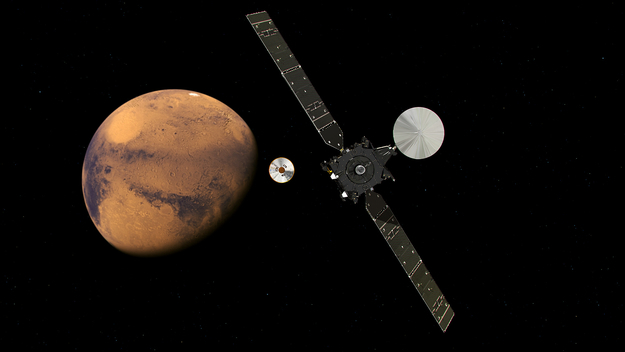 The Mars Science Laboratory is its official name. It carries the most complete and complex set of instruments currently on the surface of Mars. In five and a half years of mission, it has already collected important clues about the present and past conditions on Mars. Even before moving to the surface of Mars, Curiosity has already accomplished some technical feats. Since the landing of Sojourner in 1997, NASA has sent big rovers on Mars : Spirit and Opportunity weigh 180 kilos. The Curiosity rover has the mass and dimensions of a small car, which allows it to carry ten times the mass of instruments of the previous rovers. But putting such a mass tens of millions of kilometers away from NASA’s control centers is complicated. The American space agency has had to develop a bold and terribly effective solution. The atmosphere of Mars is too thin for parachutes land an object of the size of Curiosity. 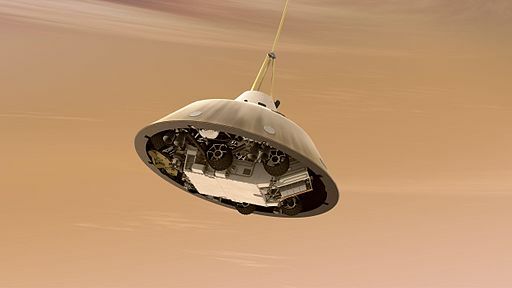 The atmosphere of Mars, however, is thick enough to disrupt the use of retro-rockets, which prompted the US space agency to consider a hybrid solution : the landing of the Curiosity rover used a heat shield, a parachute, retro-rockets and even a crane. The complexity of this landing was a huge gamble. Curiosity accounted for 7 years of work and $ 2.5 billion. After eight months of travel, August 6, 2012 the rover and its spacecraft arrive at the level of the atmosphere of Mars. The landing of the rover was highly publicized and was watched by millions of spectators. The landing sequence lasted 7 minutes during which the descent module operated autonomously. The sequence begins with a guided atmospheric entry. The descent module is equipped with small thrusters to help it stay on course. This is largely what allows to deposit the rover on the surface of Mars with incredible precision for an interplanetary travel. At 10 kilometers altitude, the descent module separates from its thermal shield and unfolds a supersonic parachute. The parachute reduces the speed of the descent module from the ground, from 470 to 100 meters per second. At the end of this sequence, the rover is 1.8 km above sea level. It gets rid of its top shell and parachute for free fall again. The rover is then attached to a platform on which the hydrazine propellants are located. This is the beginning of the retro-propulsion sequence. The 8 rockets further reduce the speed of the descent module. Meanwhile, the Curiosity rover leaves its flight configuration to take a landing configuration. The retro-propulsion rockets manage to completely cancel the speed of the rover, but they do not bring it to the ground. At 7.5 meters altitude, the descent module stops. If the rockets approach too close to the ground, they will raise a cloud of dust that could damage the scientific instruments of the rover even before the start of its mission. The solution chosen by the project engineers is to lower the rover with cables, a bit like a crane. The Curiosity rover, which has the size of a car, is then suspended under a platform itself levitating with rockets, on a planet tens of millions of kilometers from the Earth. After 7 minutes of descent, the Curiosity rover is deposited just 2.4 kilometers from the center of the ellipse planned by NASA. It’s a real feat. What’s left of the descent module and the crane will crash 650 meters away. The Mars Science Laboratory rover is not just a stuntman, it’s above all a great machine to do science. Its mass far superior to that of other rovers that preceded it allows it to embark ten scientific instruments, some of which are very ambitious. Indeed, we must now go further than simply observing the red planet. We must now interact with Mars. The Curiosity rover is full of sensors and has 17 cameras. The navigational instruments of the rover, a weather station, particle detectors and photos of the surrounding area help to understand the conditions around the crater where the rover is located. But the most interesting instruments embarked by Curiosity are those which will be able to reveal the chemical secrets of Mars. Among the most impressive of these scientific instruments, there is the ChemCam. 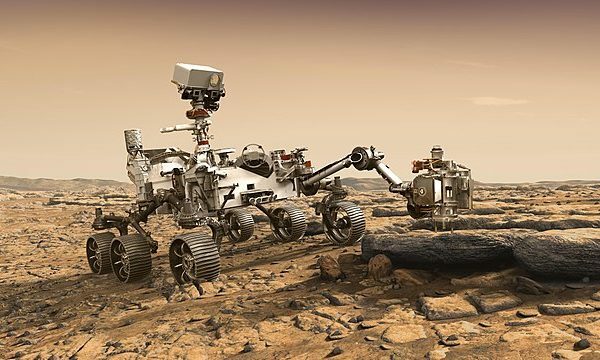 The mission engineers had the good idea to equip the rover with a pulsed laser capable of spraying small quantities of rock, to be able to conduct spectrometric analyzes. In several tens of pulses, ChemCam is able to vaporize and raise the spectrum of the targeted rock, and thus to determine its chemical composition without even touching it. This tool was produced largely in France under the direction of CNES. But the Curiosity rover does not just stay away because it has an articulated arm on which instruments intended to come into contact with the Martian surface are fixed. There is a microscope camera and an X-ray spectrometer. But this articulated arm is also equipped with a drill and a mini-excavator. The objective is to collect samples of the surface sometimes in depth to analyze them aboard one of the two laboratories located in the body of the rover. The SAM laboratory is particularly responsible for detecting any trace of organic chemistry in its samples. It is on him that rests a large part of the mission, and since August 6, 2012 these instruments worked a lot. In five and a half years, the Curiosity rover has traveled a little more than 18 km, which may seem slow but it means not leaving any details of the environment and also to preserve the wheels of the rover suffering on the rocky surface of Mars. During these long years of study, Curiosity was able to detect sulfur, nitrogen, oxygen, phosphorus and carbon on the surface of Mars. This environment is therefore able to support a microbial life. In addition, the SAM laboratory analyzes revealed elements of carbon chemistry in a sample taken. But carbon chemistry is intimately linked to life. That’s why we talk about organic chemistry to describe carbon compounds. The atmospheric observations of the rover have also attracted the attention of scientists. 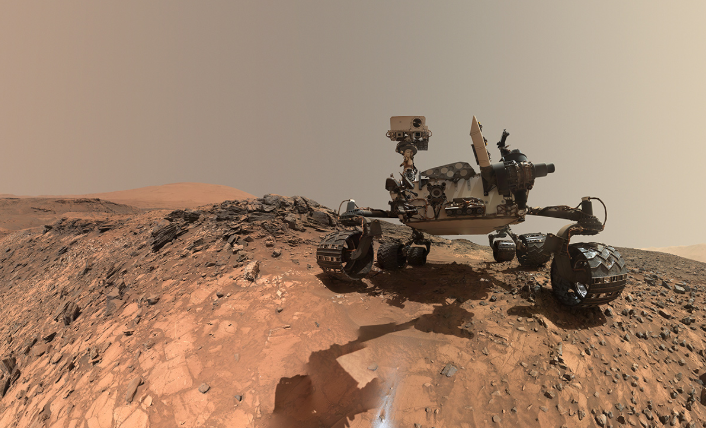 The scientific instruments of the Curiosity rover have revealed methane in the Martian atmosphere. In addition, the amount of methane observed is not stable. It was multiplied by 10 over a two-month observation period. So there is a process on Mars that produces methane irregularly. This is typically the type of observations that could be attributed to living organisms. But in the absence of additional evidence, however, nothing can be certified, especially since the rover has also given bad news about life. Measured radiation levels have repeatedly exceeded the limits set by NASA for its astronauts. Solar wind and cosmic rays bombarded the Curiosity rover incessantly. We must not forget that the planet Mars has unfortunately no magnetic field, it is a data to be taken into account for future inhabited missions. Among the most exciting sightings of Curiosity, there is the shape of the rocks. Their smooth, rounded edges suggest that they have been eroded by a river for long periods of time. Some sections crossed by the Curiosity rover reveal a small but shallow river. But it was billions of years ago. The Mars Science Laboratory rover has performed quite well. In 2020, NASA will send a new rover to the surface of Mars, which looks a lot like Curiosity, but with new instruments to improve our knowledge of dry rivers, methane emissions and organic chemistry of Mars.